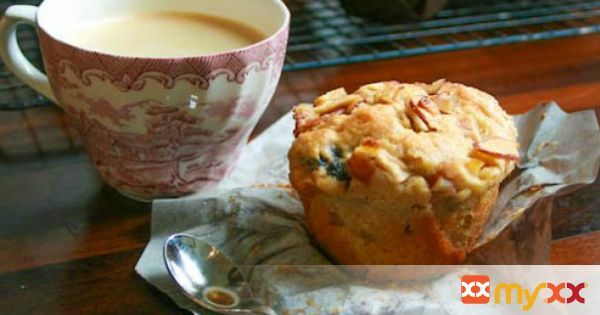 These breakfast muffins are extra special and completely over the top. I came up with the recipe based off a crisp recipe that I have that is truly delicious, but you can’t have a crisp for breakfast……. can you?? hmmmmm But, seriously as muffins go these are pretty healthy. I cut down the flour and added almond meal, which is made with ground almonds which have proven to reduce risk of heart disease with antioxidant action of the vitamin E, and of course all that fruit that’s in there helps! 2. Line 12 cup muffin tin with liners and spray with baking spray. 3. Line a tray with almond slices and sit in oven for 4-5 minutes until almonds are just starting to toast, but not brown. 4. Remove pan and let cool. 5. Place flour, almond meal, baking powder, baking soda, cinnamon, nutmeg, and salt in a bowl and mix well to combine. 7. In a mixer beat 1/2 cup of the butter and sugar until creamed. 8. Add one egg at a time until mixed. 9. Scrape down sides of mixer and add sour cream, zest and vanilla blend. 11. Remove bowl from mixer and by hand add apple and cherries, mixing. 12. Spoon mixture into each cup filling about 2/3 of the way. 13. In a small bowl combine, pear, brown sugar, 2 tablespoons of butter and almonds and combine. 14. Place on top of each muffin. 15. Bake for 25-30 minutes or until the center of a muffin comes out clean.